Is it possible to make the selection with a limit of numbers? Example, I wish to allows my visitors to register for my event. And I only have 50 seats for VIP, as if they select VIP category for 2 pax, I have to remain 48 availability for others. Anyone can advise me how can I do so? 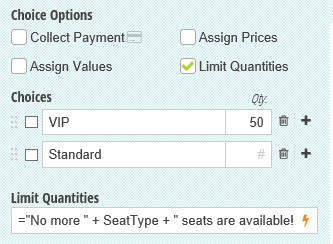 Enter the Quantity Exceeded Error Message to something like No more seats of this type are available! Can Cognito Forms calculate rental inventory availability by date and other variables across multiple form submissions? How can I give default value to second drop down selection depending on first drop down selection box? Is it possible to make Cognito Form entry data publically available?